It has been suggested that this article be merged into Yogurt. (Discuss) Proposed since January 2019. Dahi (Hindi/Marathi: दही, Urdu: دہی dahī; Bengali: দই, Assamese: দৈ, Sylheti: ꠖꠂ doi; Tamil: தயிர் thayir, Kannada: ಮೊಸರು mosaru, Telugu: పెరుగు perugu, Malayalam: തൈര് tayir) is a traditional yogurt or fermented milk product, originating from the Indian subcontinent, usually prepared from cow's milk, and sometimes buffalo milk, or goat milk. It is popular throughout the Indian subcontinent. 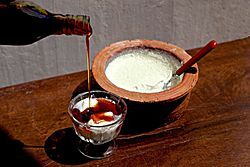 The word curd is used in Indian English to refer to (naturally probiotic) homemade yogurt, while the term yogurt refers to the pasteurized commercial variety known as heat treated fermented milk. Dahi is made by bacterial fermentation of milk. In this process lactose in milk is converted into lactic acid by several probiotic microorganisms. The species involved in the fermentation depends on the temperature and humidity of the environment, and may include Lactococcus lactis, Streptococcus diacetylactis, Streptococcus cremoris, Lactobacillus delbrueckii subsp. bulgaricus and Streptococcus thermophilus. Dahi starter is made with dried red chillies (or their stems) in hot milk. Milk is boiled and then allowed to cool for a while. When lukewarm, dried chili peppers or their stems are added. The reason for this tradition is that dried chillies are rich in a type of lactobacilli, the bacteria that helps in fermentation of milk to form dahi. The bowl is then kept undisturbed in a warm place for 5 to 10 hours. After the starter is made, or saved from previous batch of dahi, milk is boiled and cooled. In a separate bowl dahi is mixed with its whey, and then mixed together with the milk. It is then left to sit undisturbed for 5 to 10 hours. This practice can also be applied for making dahi/yogurt from milk substitutes, such as soy milk. Buffalo curd (Sinhala: මුදවාපු මී කිරි mudavāpu meekiri) is a traditional type of yogurt prepared from water buffalo milk. It is popular throughout the Indian subcontinent. Buffalo milk is traditionally better than cow milk due to its higher fat content making a thicker yogurt mass. Mostly clay pots are used as packaging material for Buffalo curd. Buffalo curd is obtained by bacterial fermentation of buffalo milk. In this process lactose in buffalo milk is converted into lactic acid using several micro-organisms. The species involved in the fermentation include Lactococcus lactis, Streptococcus diacetylactis, Streptococcus cremoris, Lactobacillus delbrueckii subsp. bulgaricus and Streptococcus thermophilus. Buffalo curd has a higher nutritional value of protein, fat, lactose, minerals and vitamins. Quality of the curd depends on the starter culture. Fermentation also develops the characteristic flavor and colour of the product. Buffalo curd can be made in both traditional and industrial forms. Traditionally buffalo milk is filtered and boiled, the scum is removed and it is cooled to room temperature. A few spoonfuls of a previous batch of curd are added and it is then mixed well and poured into clay pots. These are sealed by wrapping a piece of paper over the pot and allowing it to stand for 12 hours. Curd is an important part of everyday diet in the Indian subcontinent, both in slow cooked food and fast food. Lassi – curd mixed with water and sweetner, usually sugar or molasses. Chaas - curd mixed with water and Sea salt, black salt or Himalayan salt. It is also known as Buttermilk. Mishti doi – curd that is fermented after adding sweetner to milk, usually cane Jaggery or date palm jaggery. ^ a b Caballero, B.; Finglas, P.; Toldra, F. (2015). Encyclopedia of Food and Health. Elsevier Science. pp. 345–351. ISBN 978-0-12-384953-3. Retrieved December 6, 2017. ^ Kristbergsson, Kristberg; Oliveira, Jorge. Traditional Foods: General and Consumer Aspects. ^ "Curd and Treacle". Lanka Newspapers. 2008-10-18. Archived from the original on 2013-09-05. Retrieved 2009-08-31. ^ Vohra, A.R. (2012). New Modern Cookery Book. V&S Publishers. p. 104. ISBN 978-93-5057-278-8. Retrieved December 6, 2017. Wikimedia Commons has media related to Dahi.